• Sr3p1/2 overlaps C1s region. Sr3d region has well resolved spin-orbit components (Δ=1.76eV, ratio=0.690). Sr metal reacts very readily with air to form its oxide, SrO. SrO reacts with atmospheric CO2 to make SrCO3. Strontium oxide is used in cathodic materials for solid oxide fuel cells. A soft, silvery element that tarnishes in air, strontium is commonly found in nature combined with other compounds, but never as the free element. Strontium reacts vigorously with water and its salts ignite spontaneously in air, imparting a brilliant crimson color often sought after in pyrotechnics. 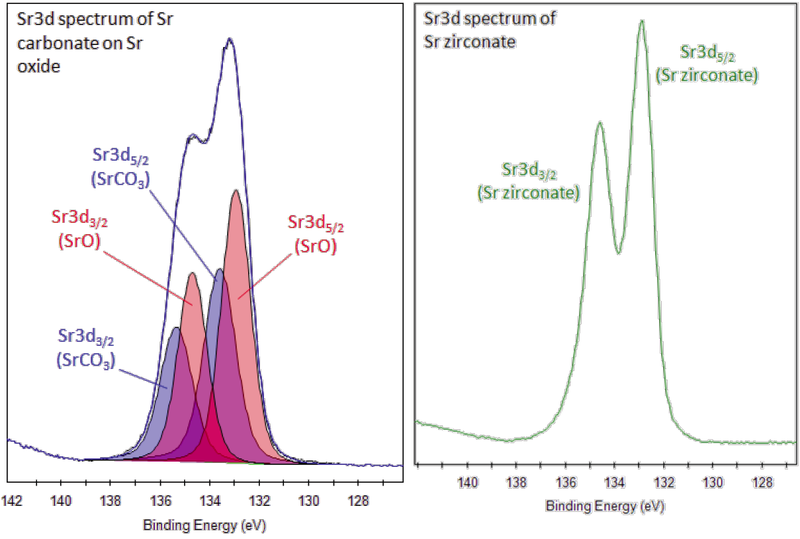 Strontium exists in three allotropic forms with at least 16 stable isotopes. 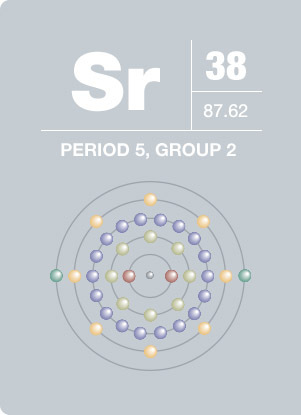 With a half-life of 29 years, 90Sr is one of the best long- lived high-energy beta emitters known. It holds promise for applications in space vehicles and remote weather stations, in which a long-lived, light-weight nuclear electric power source is needed.